Ibiscus Residence is located at the Massouri Village, at the western coast of the island and it�s by any means an ideal starting point for your holiday in Kalymnos, probably the best combination of the loveliest sightseeing, some of the greatest beache in the island and availability of all kinds of tourist services and connections to all the key-spots in Kalymnos. Ibiscus is only 30 meters far from the main beach of Massouri (see picture�) a wide sandy beach complete of all kinds of tourist services these including bars also serving food, sun-umbrellas, sun-chairs, canoe and pedalos-renting. Yet, if you�re more of a fan of tiny quiet and not quiet crowdy beaches, Massouri has all of that and at Ibiscus you�re only minutes far from so many of them, you�ll only be left with the difficulty of choice. Ibiscus is just 10-15 minutes on foot far from the tiny harbor of Myrties where traditional fishermen�s boats take you (se ?�???? �as?) in a 15 minutes sail, to the island of Telendos, another quiet astonishing place you just can�t allow yourself not visiting. 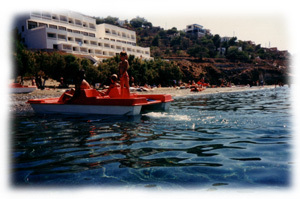 Spend a day at the beaches of Telendos, take a quick tour round its tiny village, enjoy a traditional Greek meal at its restaurants or just enjoy o bottle of Greek retsina wine and don�t miss the final part of your short, improvised tour, the view of the sunset from the left extreme edge of the island. Whatever you see there you simply won�t ever forget! Within Ibiscus you�ll find a mini-market with the widest variety of all products you�ll ever need during your vacation but even if you�re looking for something more specific, all drugstore, mini-markets, jewellery, souvenirs and Greek traditional handicrafts shops in the Village will be only few minutes far from you. You really could not find yourself in a more confortable position at Massouri. 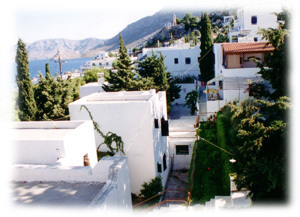 Ibiscus is located right before Massouri square where all kinds of connections to virtually the rest of the island and certainly all its key-spots, are available: bus lines to Pothia (capital of Kalymnos) and all the intermediate main villages, as well as other more remote � but not less interesting � spots such as Linaria or Emporios with their lovely and quiet beaches. 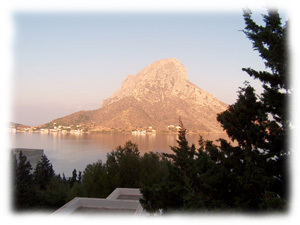 Taxis are also widely available For all you independent, free-spirit and adventure-loving tourists, climbers and folks thirsty of discovering the hidden treasures of Kalymnos, Ibiscus Residence makes an ideal and by all means perfectly equipped starting point. In fact, Ibiscus also makes a great base for climbers, since it�s located quiet close to most of the main climbers routes in the island. Check out our climbers page for more details!